Source: I won this book from Deb Marshall at Read Write Tell. She reads a lot of MG, so go visit her soon. Synopsis (from the publisher): Gregory K. is the middle child in a family of mathematical geniuses. But if he claimed to love math? Well, he'd be fibbing. What he really wants most is to go to Author Camp. But to get his parents' permission he's going to have to pass his math class, which has a probability of 0. THAT much he can understand! To make matters worse, he's been playing fast and loose with the truth: "I LOVE math" he tells his parents. "I've entered a citywide math contest!" he tells his teacher. "We're going to author camp!" he tells his best friend, Kelly. And now, somehow, he's going to have to make good on his promises. Hilariously it's the "Fibonacci Sequence" -- a famous mathematical formula! -- that comes to the rescue, inspiring Gregory to create a whole new form of poem: the Fib! Maybe Fibs will save the day, and help Gregory find his way back to the truth. Why I recommend it: This is a perfect back-to-school read. If your kids are groaning because summer's almost over, give them this book. They'll get so involved in Gregory's predicament they might even forget school is coming. Gregory is a likable and realistic character. Whether or not math is your strong suit, you'll enjoy this. I did well in math, right up until Geometry, and then I earned my first-ever D. So I empathized completely with Gregory. You'll also love the Fibs, the poems Gregory writes. Six lines, based on the beginning of the Fibonacci sequence (0, 1, 1, 2, 3, 5, 8). You may even be inspired to write one of your own! Give it a try. I've written eight of them since I read the book. First line is 1 syllable, second line is 1 syllable, third is 2 syllables, fourth is 3 syllables, fifth is 5 syllables, sixth is 8 syllables. No need for rhyme, but rhyme if you want to. And now for a special treat, here's an exclusive interview with Greg Pincus. 1) First of all, welcome to My Brain on Books! The story of how The Fourteen Fibs of Gregory K. became a book is an unusual and fascinating one. I understand Arthur A. Levine spoke to you about it before you actually wrote it. Can you tell us briefly how the novel came to be? The novel definitely came about in an unusual fashion. I'd met Arthur at my very first SCBWI conference and had been submitting picture book manuscripts to him. My cover letters and follow-up letters, however, seemed to get a much better reaction than many manuscripts - they were funny, somewhat snarky, and, in retrospect, better writing than the picture books. Arthur felt that I should be writing novels. I kept sending him short stuff. Then in April of 2006, my blog and I went viral and into the New York Times, all due to poetry based on the Fibonacci sequence. Arthur saw this as an opportunity to combine various things we both liked - the tone of my letters, Fibonacci poetry, my other poetry, and his desire to have me write novels. We came up with the very broad idea of The 14 Fibs of Gregory K. on a phone call - there was no manuscript when I got the deal back in 2006 - and over time, it morphed and changed and revised itself into the final book. 2) You're not only a poet and a middle grade novelist, you're also a screenwriter. In what ways did screenwriting help you craft this novel? I found that screenwriting helped in terms of writing individual scenes - keeping multiple things happening and ending them before they've gone too far, in particular. I actually found my screenwriting to be a bit of a problem in terms of not always filling in the visual details of a scene. I mean, heck, it's all gonna be there on the screen, right? Uh... no. 3) Do you have a writing routine? Outline or pantser? Morning or evening? Coffee or tea (or chocolate)? I am a combination of outliner/pantser in the sense that I always do have an outline, but in areas where there's not much detail, I'm fine winging it. I write when there's time, and always have, but love bigger chunks of contiguous hours, so if my schedule looks like I'll get that in the evening, I'm an evening writer, but if there's only free time in the morning, I'm a morning writer. And coffee and chocolate, of course! 4) Do you still write Fibs? Can you share a favorite one with us? I do write Fibs as a kind of warm up session for myself (which is how I initially used them). The focused form truly helps me focus on word choice and the like. And I still find it VERY hard to come up with good ones. Still, one of my favorites remains A Beach Fib, posted over at my blog - http://gottabook.blogspot.com/2006/07/beach-fib.html. 5) I LOVE A Beach Fib! Thanks so much for sharing. Greg, you're one of the founders of #kidlitchat. What would you like to tell my readers about it? Even after five years on Twitter (a social media eon! ), #kidlitchat is still going strong every Tuesday night at 9 PMEastern/6 PM Pacific. It's a fun, low-key way to hang out with some fellow children's literature lovers, get inspiration and resources, and make friends. Plus, when it really gets going, it can teach you just how fast you can read! 6) Please satisfy my curiosity: did you name your character after yourself? Is he you as a kid? I had been writing a lot of individual poems, and many of them came out in the voice of the same kid. I had been writing the poems as "Gregory K." rather than Greg Pincus (or really, rather than Gregory K. Pincus which is what I'd been writing screenplays as). When Arthur and I discussed the book initially, we decided that the "poem voice kid" had a good perspective and the novel was going to be about a kid who wrote poetry. Then Arthur came up with The 14 Fibs of Gregory K. as a title (perhaps the only thing that remained from the first conversation to the final book! ), and who could argue with that? He is definitely not me as a kid, nor is the book autobiographical! Here's a post from Greg's blog, Gotta Book, about Fibs. Be creative, readers! Write a Fib and share it with us. Leave it in the comments (unless you're shy). For other MMGM recommendations, visit Shannon Messenger's blog. Screaming at the Ump by Audrey Vernick for MMGM, plus An Interview! Source: I won this book from Rosi Hollinbeck, who blogs at The Write Stuff. Go visit! She has a lot of cool stuff on there. 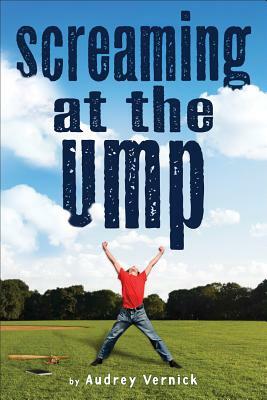 Synopsis (from Indiebound): Twelve-year-old Casey Snowden knows everything about being an umpire. His dad and grandfather run a New Jersey umpire school, Behind the Plate, and Casey lives and breathes baseball. Casey's dream, however, is to be a reporter--objective, impartial, and fair, just like an ump. But when he stumbles upon a sensational story involving a former major league player in exile, he finds that the ethics of publishing it are cloudy at best. This emotionally charged coming-of-age novel about baseball, divorce, friendship, love, and compassion challenges its readers to consider all the angles before calling that strike. Why I recommend it: Well, yes, I grew up with baseball. Some of my earliest memories include chasing fireflies around my backyard while my parents listened to the Phillies game on the radio. As a teen, I went to a lot of home games and knew all the players and their stats. Surprisingly, though, I'm not much of a baseball fan now. Yet I still loved this book. Whether or not you love baseball, you'll enjoy reading Screaming At The Ump, especially for Casey's authentic voice and the wackiness of his best friend, Zeke. The title gets my vote for Best Title So Far This Year. There's a lot of humor here, not just boy humor. But then the book goes deeper, which is what I love most about it. Vernick deftly handles not only Casey's feelings about his parents' divorce, but about the former major league player who shows up at Behind the Plate under a different name. Casey's struggle over doing what's right will resonate with the reader. This is one of those books you'll think about long after you've turned the last page. And now for a special treat: an interview with Audrey Vernick! 1) I know you're a baseball fan and have also written some nonfiction picture books about baseball (Brothers at Bat; She Loved Baseball: The Effa Manley Story). What made you decide to write a novel about umpire school? Long before there was instant replay in baseball, probably about seven years ago, there was one postseason in which the umpires got a lot of important calls wrong, calls that changed the outcome of games. Talk radio was buzzing with it. It made me wonder how umpires became major-league umpires. A little quick research revealed that they have to go to umpire school--there are two in Florida and all major league umpires started there. (Who knew?) I found it really intriguing, the mere fact that umpire schools exist. Combine that fact with this: I have a tendency to write too "quiet," to like character-driven work, which editors point out makes it hard for a title to stand out on their list. Knowing this about my writing self, I thought using an unusual setting might be enough to allow for a less-than-shocking-at-every-turn kind of plot. I don't enjoy reading plot-driven fiction, and I don't think I could even write it if I wanted to. Writing a book that takes place in an umpire school felt like it would give me a chance to write the kind of book I enjoy writing that might be publishable. 2) Well, you certainly hit it out of the ballpark with this one, Audrey. Could you tell us a little about your journey to becoming a published author? Did you start out writing picture books? If so, how difficult was the transition to middle grade novels? Before I wrote for kids, I wrote literary short fiction. I published about a dozen stories in literary journals and magazines. I lived through the skin-hardening years of rejection then, for the most part. I switched to writing for children over a decade ago and the first book I wrote, Bark and Tim: A True Story of Friendship, was co-written with my sister Ellen Gidaro. It was an odd book, in that the illustrations kind of had to be the paintings of the artist Tim Brown, whom the book was about, so there we were--submitting a book complete with illustrations, the exact-wrong way to begin. It took a very long time to find a publisher--a small regional press in Tennessee. That book was published in 2003. My next book for children came out in 2010. I point to those seven years as my real learning curve. There came a point where I wanted an agent to handle the submission side of things. There were so many fewer agents then than there are now, and the common thinking was that one needed to catch an agent's attention with a novel. Also, as the graduate of an mfa writing program, I always knew I'd have to write a novel SOME day. So I wrote my first one, Water Balloon. It was called Dandelion Summer then. It was hard. And I think writing novels is so hard. I remember the very tentative steps I took in the beginning, writing a chapter or two and needing to send it to a reader-friend right away, asking, "Is this how you do it?" The hard part, of course, is to keep doing it. When I had a finished, revised draft I found an agent and she submitted it widely and failed to sell it. It wasn't until many years later, working with my current (second) agent, that I decided to pull it out of the drawer and give it another try. I revised with an eye toward making it less quiet--not a lot less quiet, but enough. And I was lucky that the book found its meant-to-be editor, Jennifer Greene, at Clarion. I find the process of writing picture books comes naturally to me. I have to work much harder on novels. 3) Oh, I agree. Writing novels IS hard! I'd love to hear about your writing process. Do you outline the entire novel before you write or are you a pantser? Or a little of both? Do you write every day? Oh heavens, I have no real process. Over the years, I've learned to trust that when it's time to write, I'll write. (This could be classified, accurately, as deciding that it's okay to be undisciplined and possibly a little lazy). I do not outline, but I do like to have some idea about how my story will end, so I have a direction to write in/toward. I do not write every day. I go through patches when I work a lot--usually on several different projects. And when drafting novels, I usually have several 8,000-10,000 word days--awful words, to be clear, but words, to move me along, otherwise I'd never be able to do it. When I'm somewhere between halfway and two-thirds done, I usually try to come up with a list of scenes that will get me to the finish line. And I don't always write those in order. My advice is to not conduct one's writing life the way I conduct mine. 4) I think you're doing just fine, Audrey. Everyone's writing process is different. Please tell us: what three MG authors have influenced you the most? Three. Hm. Maybe I can do this. I can never pick a single favorite anything, but three? My mom, Judy Glassman, wrote a wonderful middle grade novel, The Morning Glory War, which was accepted for publication a few months before she died (a sudden, unexpected death). Lynne Rae Perkins wrote the book I wish I wrote in All Alone in the Universe. Louise Fitzhugh, because I've probably reread Harriet the Spy more than any other book. 5) I’m so sorry to hear that about your mom, but how wonderful that you have her book. And I totally agree about Louise Fitzhugh! Now I'd better read All Alone in the Universe. For my final question: if you could live anywhere in the world, where would it be? Because one has to factor in how close one's family and friends would be, I think I'm pretty content to stay right here. A little over an hour outside of NYC (without traffic, as in, in a world that doesn't exist), very short drive to the beach, short drive to family. Lucky you! Thanks so much for being here, Audrey! For other MMGM recommendations, see the links on Shannon's blog.